Looking for a super zoom compact camera. Well Canon just release a new super zoom compact camera the Canon PowerShot SX510 HS, which seems like a replacement for the Canon PowerShot SX500 IS. So do you go for the new (Canon PowerShot SX510 HS) or old model (Canon PowerShot SX500 IS)? One thing that is weird is that Canon have decided to put a 12 megapixel image sensor in the camera instead of a 16 megapixel image sensor. It is normal that the sensor gets the same or a bigger sensor. So why have Canon done this with this new camera? Well the main reason would most likely be because they want better performance at high ISO, which means better performance when shooting pictures in low light situations. Time will tell if this decision by Canon was smart. To make things even better in low light situations the Canon Powershot SX510 HS also has the HS software system that makes low light pictures look even better. A couple of minor improvements has also made it to the camera. The battery life is better in the Canon PowerShot SX510 HS, which is great if you are travelling with the camera which most likely will be one of the main uses of the camera. The camera like most camera introduced at the moment also have wifi module, so that makes it easy share pictures on the Internet. How many pictures that can be taken at the same time has also been improved. The price difference isn't big (just $15), so the new model even with a small image sensor just seems like the best buy. 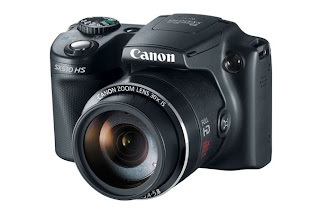 Follow the Canon PowerShot SX510 HS at Canon Index.